It maps movement nearly flawlessly, but accuracy is an annoyingly mixed bag, however. If you're anything like us, you've sat in on a fair few PowerPoint presentations. You may also have noticed a common theme: Dicky Mouse Disorder. DMD occurs, for example, when a Bluetooth optical mouse is used to control a presentation when the PC it's linked to is on the other side of a football fieldsized auditorium. 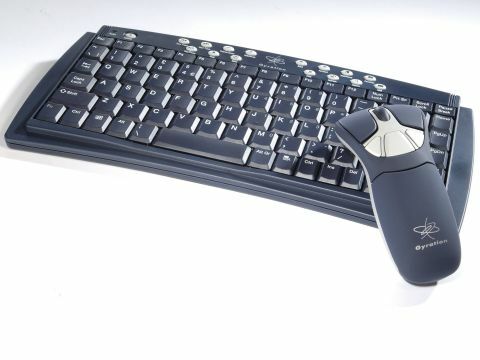 Optical mice rubbed on orator's legs do not produce pinpoint accuracy, so there have been a raft of wireless clicker solutions released recently. Unfortunately most of these devices can only click back and forth through a bunch of slides. Actually pointing out items in the presentation is beyond them, and usually left to a built-in laser pen. Using an internal gyroscope, the Go 2.4Ghz enables the user to move the cursor accurately around on screen by waving the unit around in the air. In this mode, the unit works regardless of its orientation to the PC. It can be used on a fl at surface as an 800dpi optical mouse, but it's not ideal. Accuracy is an annoyingly mixed bag, however. It maps movement nearly flawlessly, but there's a frustrating element of lag in timing that means the range of applications this device is useful for are limited. For example we hooked it up to some games and were quite surprised. It's aim is accurate in First Person Shooters, but a slight delay means that it's eventually useless for any app that requires instantaneous response. This means games such as Quake are out, but Real Time Strategies and the like are fine. That flaw aside the Go 2.4ghz excels in every other task asked of it. For presentations you won't fi nd a better device but the gripe that keeps us from recommending it wholeheartedly is that it costs a fortune.